With the mess strewn around and toys scattered all over, one can easily know there is a baby in your house. Mommies, at the age of 16 months do not take your little one too seriously. Instead, learn to enjoy this beautiful growing up phase. Stepping into the 16th month is the time when your baby can easily escalate to frustration and appear impatient. She still needs to learn to regulate her emotions. As a parent, you need to make sure that you stay calm when she throws tantrums. At this age, your baby is developing at a rapid speed. 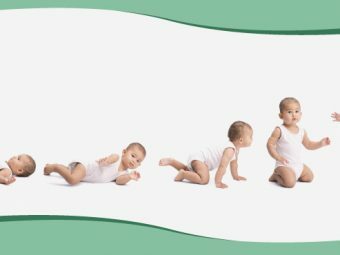 Take a look at the following to know your 16 months baby development. Your baby is quite the grown up at this age and can follow different directions. She will be walking on her own. In fact, you may also find her walking backwards. She may be able to kick balls and jump with time. She will gradually learn to string words to make phrases. You can now hold basic conversations with her. She may learn to giggle when you make funny faces or tickle her gently. Be prepared, she will say “no” to you more often. She will express her likes and dislikes as well. She will repeat the actions you approve. Even though she is not ready to read, she will love to stare at pictures and point at them. Give her a crayon or a pencil to scribble. She will want to feed on her own. You can start her toilet-training at this age. There is no need for you to worry, even if she has not reached the expected milestones. You can speak to your doctor and ask if intervention of any sort is necessary. You must be aware of the oral hygiene for your baby. The toothbrush you choose must be soft and meant for little ones. You can begin her oral hygiene routine with warm water. For the toothpaste, you need to wait till she is capable of rinsing and spitting. Don’t feel disappointed if she is not willing to brush. She will learn with time. 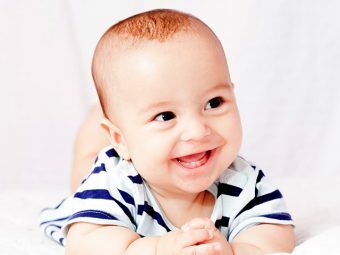 Your baby at this age is ready to say the magic words like “thank you” and “please”. However, you must not push her at every instance to say them. Every baby has her own pace of development. Maybe she just needs a little more time. Your baby at this age will observe when people use such words. If you are expecting her to say these every time, you are being unreasonable. Babies learn by imitating. You need to set good examples for your child to imitate and learn a new etiquette. 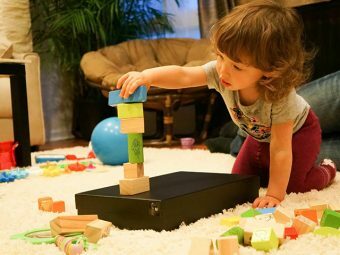 Playing is the core activity through which babies learn. Give her age appropriate toys. Push toys like trucks and buses can encourage her to walk. Simple things like plastic boxes and wooden spoon can help her learn too. Watch your little one having fun for hours together with anything she gets hold of at this age. Inexpensive bath toys such as nesting beakers are very popular among babies. We understand that temper tantrums are hard to deal with. But they can become easier for you to handle if you understand what she wants and decide accordingly. Aggression is natural human responses, but the difference between you and your baby is that you have learned to handle it. Be calm and act right. To show her frustrations she may throw things at you or her siblings. It is your responsibility to bring her under control if she throws or hits in inappropriate ways. You can enjoy the simple pleasures of singing and reading together. Take your child for a walk outside regularly. This will provide her ample scope to enhance her running or crawling skills. In case you are planning to get back to work, it is very important that you organize your chores. Planning in advance and prioritization will help you spend quality time with your child. Your baby is now busy exploring the world around her and is developing different skills. Her activities help her to get comfortable with the surroundings. Help her become aware of her abilities and set simple rules. As your baby is leaving her infancy and is growing into a toddler, you need to be aware of all the safety measures both inside and outside the home. Do consult your doctor if you find any issues regarding your 16 month baby development. Moms tell us about your experience with your baby development at 16 months in the comment section below.